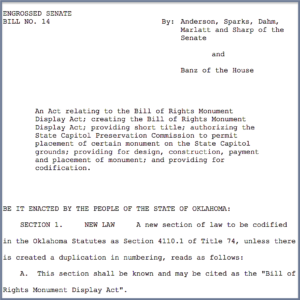 The Oklahoma House today unanimously passed SB 14, MyBillofRights.org’s initiative to authorize a privately-funded monument of the Bill of Rights on the grounds of the Oklahoma Capitol. Our special thanks and appreciation for the leadership of Rep. Gary Banz (R-District 101), who has been a supporter of the monument proposal from when it was first put forth in 2014. The bill now goes to the desk of Governor Mary Fallin for her signature.